Kevin Eastman is on art and writing for this story, which is a simple tale about the turtles training on the rooftops of New York. The art is also in black and white, reflecting the old school style of the original self-published issues. Though originally based on the original cartoon series, the Archie comics TMNT Adventures took some drastic departures from the show in later issues. For instance, Bebop and Rocksteady gave up their life of crime to become nudists. No, really. Despite becoming space hippies, they still crave Earth junk food, so they decide to pilot a UFO to Central Park and hit a grocery store. At first, the turtles are understandably a bit confused by all this, and Raphael and special guest cameo Ninjara try to beat the two former henchmen up, but eventually everything is cleared up, and writer Dean Clarrain and artist Chris Allan even take the time to point out that, environmentally speaking, the correct answer to story’s title is neither. My favorite of the vignettes. Writer Gary Carlson and artist Frank Fosco tell a story about the turtles fighting a cybernetic raccoon (a take that at Rocket?). It’s weird. 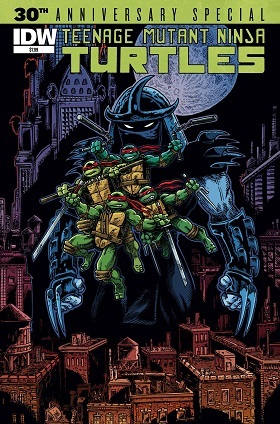 Technically, the Image Comics run of TMNT was the third volume of the original TMNT story (and I didn’t count it as a separate continuity in an earlier article), but it is generally considered non-canon to later Mirage Comics. Heck, turtle fans at least talk about how we don’t talk about the “girl turtle.” We don’t even talk about not talking about the Image comics. It was very brave, and even nice, of IDW to include this iteration of the turtles, but at the risk of writing something as dumb as “these aren’t my ninja turtles,” well, these aren’t my ninja turtles. The creators behind this iteration took some risks, which is laudable. Too bad the risks didn’t pan out. The later issues of the Mirage comics actually featured the turtles and their supporting cast aging in basically real time, which made the comics’ title a bit inaccurate, but was at least interesting. In this short story by Jim Lawson, we get another cameo from a TMNT character specific to the era being covered, but it’s a bit of a spoiler, as she’s in disguise. Of course, since she’s a comic book character, even if I did reveal it, most people wouldn’t recognize her, but those who did would be the ones most disappointed by the spoiling. So, I guess I’m done here. Original IDW writer Tom Waltz and artist Dan Duncan reteam for this story, which features Raphael and Casey Jones. It’s a pretty common TMNT story, where Raphael gets angry about his family and then has Casey Jones remind him how good he’s got it compared to his messed up family life. Not the most action packed or original ending.